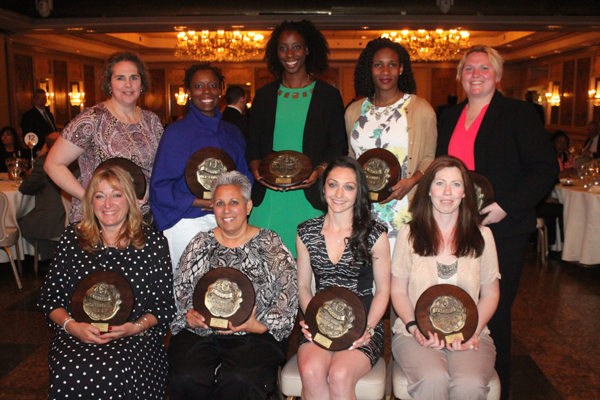 The GCHSAA of the Diocese of Brooklyn inducted a new 11-member class to its Hall of Fame April 21 at Russo’s on the Bay in Howard Beach. Lorraine “Bouk” Bouklas was a four-year, four-sport varsity athlete at West Islip H.S., L.I. After graduating in 1975, she went on to attend SUNY Cortland, N.Y., where she played tennis and lacrosse. She began coaching JV basketball at St. John the Baptist H.S., West Islip, in 1980. For the last 20 years, she has served as athletic director. Clare Droesch was a three-time Newsday Player of the Year selection for the varsity basketball team at Christ the King H.S., Middle Village, which won three straight State titles. She was named an All-American as a senior and went on to appear in four consecutive NCAA Tournaments playing for Boston College, Chestnut Hill, Mass. She became a member of the school’s 1,000-pt., 500-rebound club. After playing overseas and various coaching stops, she returned to coach at alma mater. In 2012, she was diagnosed with stage 4 breast cancer. She continues her valiant battle and serves as an advocate for raising cancer awareness. Kerri Gallagher starred on the track team at Bishop Kearney H.S., Bensonhurst, where she achieved six personal best times before her graduation in 2009. She ran at Fordham University, where she decreased her personal best times significantly. She continues to run and serves as an assistant track coach at American University, Washington, D.C. Last year, she finished third at the USA Track Federation Outdoor Championships to qualify for World Championships in Beijing, where she reached the semifinals. Gallagher has already qualified for the Summer Olympic Trials, set to be held in July in Oregon. She hopes to compete in Rio de Janeiro. Donna Lohrey Classie was an integral part of putting The Mary Louis Academy, Jamaica Estates, basketball program on the map. As a player, she guided the team to its first-ever trip to the N.Y.S. Championships. She was named Federation MVP during the school’s run to its first Federation title. She earned All-City honors from all the local newspapers as well as a full athletic scholarship to Molloy College, Rockville Centre. At Molloy, she broke multiple school records and was named the conference’s Rookie of the Year, selected to All-Conference teams and named an Academic All-American. Maryanne Marshall Marsaggi was one of the best athletes in the history of St. Edmund Prep H.S., Sheepshead Bay. She played four years of varsity volleyball, basketball and softball. She scored over 1,000 pts. in her high school basketball career en route to attending at Molloy College, Rockville Centre, L.I., where she continued to play all three sports. She scored 1,000 pts. in her college career. For the past three years, she has coached Catholic Youth Organization (CYO) sub-novice boys’ basketball at Our Lady of Hope, Middle Village. She currently coaches CYO softball. Nicole Maxwell-Freeman came to Bishop Loughlin H.S., Fort Greene, by way of Holy Family School, Canarsie. At Bishop Loughlin, she became a distinguished member of the school’s track program in the mid-1990s. She finished the cross-country championships in Van Cortlandt Park, the Bronx, with a time of 16:01, just shy of the school record 15:58. She attended Trinity College of Vermont, Burlington, and then the University of Scranton, for her master’s. Maxwell-Freeman returned to Bishop Loughlin in 2002 as a volunteer track coach and later was elevated to an assistant position. She became dean of students at the school in 2007. Jim McElroy was born in Brooklyn in 1930 and, despite being diagnosed with polio at an early age, he excelled in baseball and basketball. He represented Good Shepherd parish, Marine Park, in CYO sports. He was appointed executive director of the diocesan GCHSAA in 2000, serving as a liaison between the high school principals and athletic directors. Before he retired in 2010, he ensured girls’ sports were given access to the same resources as the boys. Tanya Osbourne won 10 individual gold medals in track championships while competing for Bishop Loughlin. She was voted Outstanding Athlete of the Indoor City Championships in 2002 and anchored the 3,200-meter relay team that set school and league records in 2003. She earned a track scholarship to Louisiana State University, where she became the SEC champion in the 800-meter race and was named SEC All-Conference four times. She clocked a personal best time of 2:04.97 in the semifinals of the 2004 USA Championships. She currently works as a mental health counselor. Ann Marie Rich is a 1982 graduate of Bishop Ford H.S., Park Slope, where she spent four years on the cross-country, basketball and softball teams. After graduating from St. Francis College, Brooklyn, and Queens College, she began teaching health and physical education at Bishop Loughlin H.S., Fort Greene, in 1986. She began coaching JV softball at St. Francis Prep, Fresh Meadows, in 1987 and became the varsity coach in 1995. After successful JV coaching, she led her varsity teams to seven diocesan, four city and one state championship. Rich was selected coach of the year five times and served as league commissioner from 2005-2014. She currently is also a biology and human anatomy teacher at the Prep. Mary Trapasso began swimming for the St. Patrick/St. Ephrem, Bay Ridge/Dyker Heights, CYO team. She went on to swim at Fort Hamilton H.S., Bay Ridge. She attended Wagner College, and began teaching in 2001, the same year she began coaching the St. Saviour H.S., Park Slope. She was integral in leading the team from the ‘B’ to the ‘A’ Division and was named coach of the year three years in a row. Trapasso was diagnosed with systemic lupus in 2013, but she continued to coach swimming the past several years. She retired this past season. Angelina Waterman-Reinecker was a four-year varsity player in both basketball and volleyball at Archbishop Molloy H.S., Briarwood. She was named First Team All-Queens as a junior and senior in basketball and was named to 15 All-Tournament Teams in volleyball. She played volleyball at American University. She was First Team All-Patriot League as a senior and Patriot League Tournament MVP. She played volleyball professionally in Italy, Greece and Spain. She returned to the states in 2012 as an assistant coach at Hofstra University, Hempstead, L.I., and is currently pursuing her doctorate at the American School of Professional Psychology at Argosy University of Southern California, Orange.